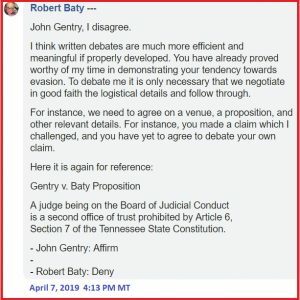 JOHN GENTRY v. ROBERT BATY! 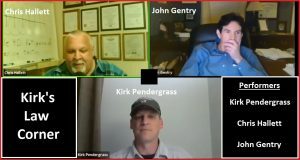 – Kent Hovind v. Robert Baty – The Great Debates! 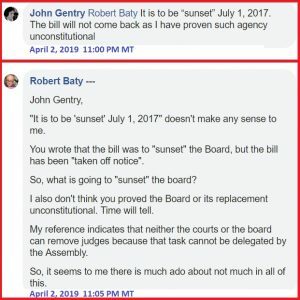 Home→JOHN GENTRY v. ROBERT BATY! 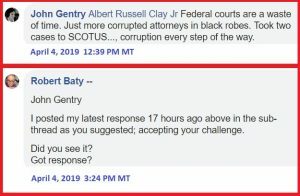 John Gentry is one of many on the spectrum disorder involving those anti-government, anti-child welfare, anti-family court people that have taken to social media to try and make names for themselves and rail against the Government. 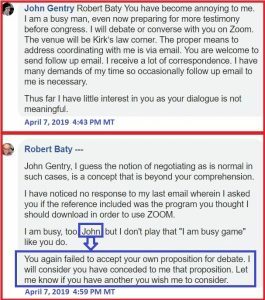 I recently accept a challenge from John Gentry and it didn’t take long for him to tuck tail and “run”; makes my job so much easier when my adversaries resort to such childish, spiteful tactics as John exhibited during our brief encounter. 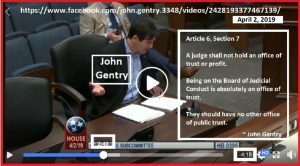 A judge being on the Board of Judicial Conduct is a second office of trust prohibited by Article 6, Section 7 of the Tennessee State Constitution. Following, as I get the time, will be the substance of our exchange, in reverse order, starting with the latest posts. I’ll just ignore and block you on social media. I’m still open to debate and am happy to coordinate that through email but I tire of your posts on my page. 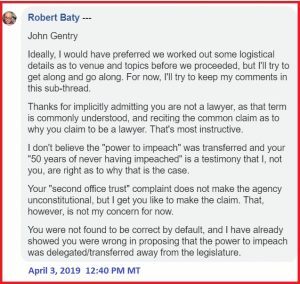 John Gentry, I guess the notion of negotiating as is normal in such cases, is a concept that is beyond your comprehension. I have noticed no response to my last email wherein I asked you if the reference included was the program you thought I should download in order to use ZOOM. I am busy, too, John, but I don’t play that “I am busy game” like you do. You again failed to accept your own proposition for debate. I will consider you have conceded to me that proposition. Let me know if you have another you wish me to consider. You have become annoying to me. I am a busy man, even now preparing for more testimony before congress. I will debate or converse with you on Zoom. The venue will be Kirk’s law corner. The proper means to address coordinating with me is via email. You are welcome to send follow up email. I receive a lot of correspondence. I have many demands of my time so occasionally follow up email to me is necessary. Thus far I have little interest in you as your dialogue is not meaningful. I think written debates are much more efficient and meaningful if properly developed. You have already proved worthy of my time in demonstrating your tendency towards evasion. To debate me it is only necessary that we negotiate in good faith the logistical details and follow through. For instance, we need to agree on a venue, a proposition, and other relevant details. For instance, you made a claim which I challenged, and you have yet to agree to debate your own claim. Section 7 of the Tennessee State Constitution. I encourage debate that helps me sharpen arguments. Perhaps you will prove worthy of my time. Thus far I only note unsupported positions from you. 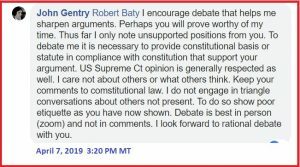 To debate me it is necessary to provide constitutional basis or statute in compliance with constitution that support your argument. US Supreme Ct opinion is generally respected as well. I care not about others or what others think. Keep your comments to comstitutional law. I do not engage in triangle conversations about others not present. To do so show poor etiquette as you have now shown. Debate is best in person (zoom) and not in comments. I look forward to rational debate with you. 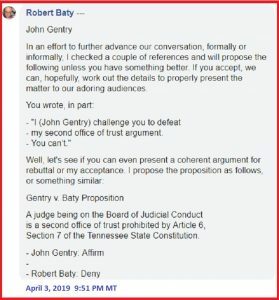 It appears John Gentry is a very sore loser. We had a brief email exchange this morning, and he seems to have “lost it” as far as the 2 of us ever getting together for a proposed “debate” on matters of mutual interest. 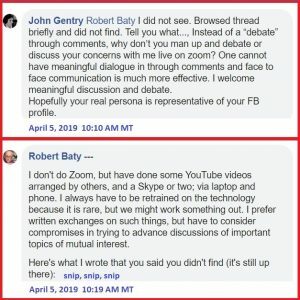 More importantly, it appears John has resorted to evidence tampering; deleting from his FaceBook page the posts noted above. 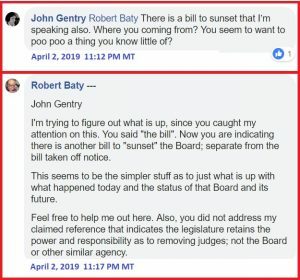 Following are the screenshots I took of the above-noted posts; for the record, and in light of what appears to be evidence tampering by John Gentry. 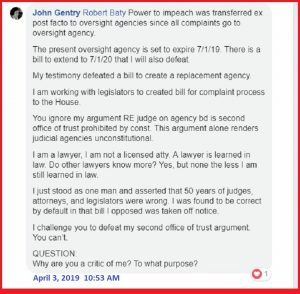 Upon further consideration, it now appears John Gentry has been even busier with his evidence tampering; deleting even more posts from his FaceBook page. 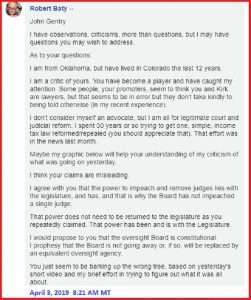 Here’s a dozen more posts, not presented in this original article above, but which also appear to have been deleted by John Gentry. 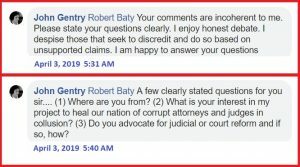 Steven Allen also responds to John Gentry! A Randy Smeltz has now also added to that thread!